Arpee is a software developer and open source enthusiast that sent in his base64 encoded string on his left arm that contains personal info about himself (name, residence, wife, affiliations, etc) and an md5 hash key value of the decoded string just in case someone tampers with the data. He’s totally ready for a Memento sort of thing. 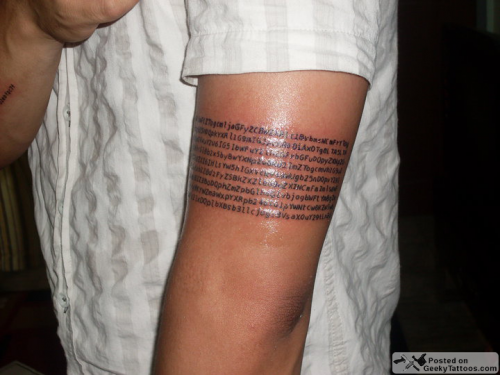 Tagged with arm, base64, forearm, md5, text. 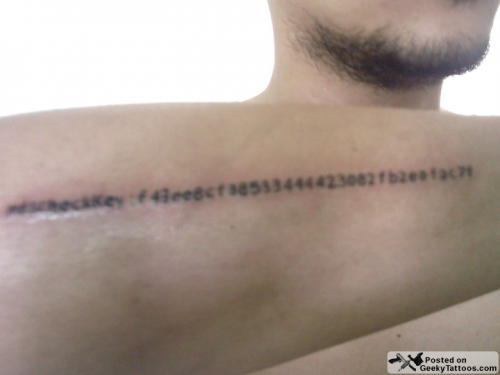 this guy is mad — md5 is considered broken, so the data in his tattoo could be tampered with w/o changing the hash! Yea, that's the crazy part. >"… contains personal info about himself (name, residence, wife, affiliations, etc)"
My God, he's seen through the illusion! He's Inception! WE HAVE TO GO DEEPER! This guy has no sense of security. Yeah, let's put all of our PII directly on our body.